More than 10 million Americans suffer from osteoarthritis, making it the most common disease in the U.S.
What are frequent causes of arthritis, and what can you do to protect your knees and other joints, reduce the symptoms, and support your doctor's treatment? With advice from many of the world's leading specialists, we have compiled useful and practical tips for self-care. 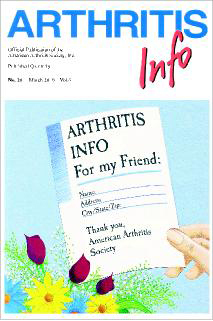 The first 25 issues of these ARTHRITIS INFOS have been published as booklets. Since they are no longer available we plan and prepare to publish these and future issues in book form. As soon as these books are published we will inform you on this web site. The books will be available through offline and online bookstores. Taking control of your health and applying the advice of the leading osteoarthritis experts will help enormously. In our section, "A Patient's Experience with Osteoarthritis," we introduce Mr. Jack Nicklaus, a world-famous golf champion, designer of championship golf courses all over the world, and devoted family man. He suffered from osteoarthritis pain in his hip for more than 35 years until he decided to have his hip joint replaced.